'Buff' is a term used to describe the color of a non-vitreous or semi-vitreous oxidation fired clay that has enough iron to take away its claim to being white yet not enough to make it a ten burning. Buff coloration is generally a straw color or yellowish white. As the body matures further the color becomes less yellowish and more greyish. Much effort is expended at Plainsman Clays to develop good transparent base glazes. Far left is a white cone 6 porcelain made from New Zealand kaolin, a super-white-burning bentonite, feldspar and silica. P300 is a kaolin-only cone 6 whiteware. 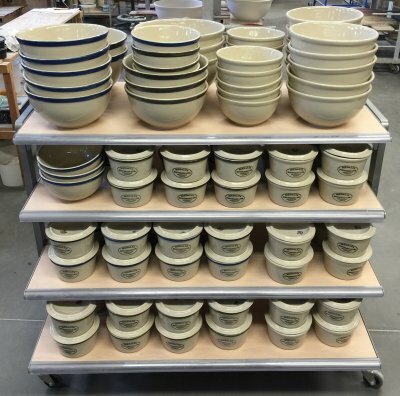 M370 is a kaolin-ball clay whiteware. The P300 and M370 recipes contain feldspar, silica and bentonite also. M340 is a buff stoneware, it is made from locally mined stoneware clays with no additions of feldspar or silica or any refined clays. These are transparent glazed and electric fired. They are made using the traditional molds of the Medalta Potteries, a manufacturing firm that operated in the first half of the twentieth century in southern Alberta, Canada. Now a historic site it continues to produce these beautiful utilitarian pieces. Visit http://medalta.org.